Hrol Ulfgar is a Nord warrior residing in Bleaker's Way, a small village in the Great Forest lying just west of the Silver Road, due north of the Imperial City and south of Bruma. Patriarch of the Ulfgar family, Hrol is but one of the targets of the Daedric Quest received from Mephala. He takes his role as head of the community responsibly, and actively participates in village life. He sleeps from midnight to 6am alone in his house. When he awakens, he eats a quick two-hour breakfast before heading to the local inn to socialize and check up on Kirsten. At midday he will head home for two hours of relaxation, before heading back outside for four hours to chat with the other villagers. At 6pm he will go back inside for another two hours, before once again exiting the house for two more hours of conversing with his neighbors. He will then call it a night, and go back inside for two hours of wandering before bed. 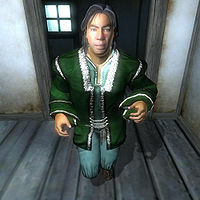 Hrol wears a set of upper class clothing: a green brocade doublet, green silk garment and a pair of green velvet shoes. He is armed with a fine iron longsword and carries his key and a small amount of gold. Asking Hrol Ulfgar about his home town, Bleaker's Way, will have him offer you a bit of information about the formation of the town; "Ulf the Bleaker settled here before Rayno Dalvilu and his family arrived. But the families have long lived together in peace." Asking him about Hrol Ulfgar will have him identify himself: "I am Hrol Ulfgar."